Have You Registered for CRO Day 2016? Well, in most cases Mom was right. Trends are called trends for a reason: they come, they go and they might leave you with an undesirable extra hole in your head. There is an exception, though: conversion rate optimization (a.k.a. CRO). Google Trends report for Conversion Rate Optimization over the past 10 years. Everyone’s doing it — even the presidential candidates. And if you’re not doing it — or you’re not doing enough of it — you could be letting conversions, and thus sales, slip through your fingers and into the hands of your competitors. What is it? 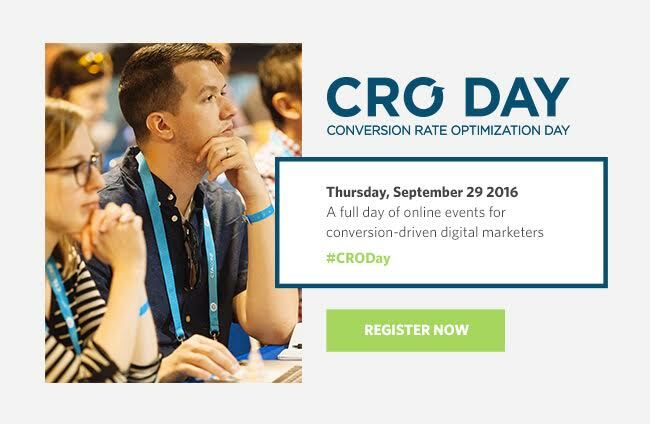 CRO Day is a full day of online events for conversion-driven digital marketers. Events include five webinars, two panels, one Slack workshop, one AMA… and a five-second Landing Page Showdown. When is it? Thursday, September 29, 2016. Where is it? Your couch, your office, wherever you are most comfortable learning all things CRO. All Unbounce-hosted CRO Day events are 100% online. Who’s gonna be there? You. And me. But also: Andre Morys, Talia Wolf, David Darmanin, Peep Laja and many, many more. The Five-Second Showdown. Join 10 conversion experts and host Oli Gardner as they dissect and improve CRO Day attendees’ landing pages based on the ol’ five-second test. An epic panel discussion featuring Joanna Wiebe, Joel Klettke and Kira Hug. The topic? How to Write Killer Copy Without Being Shady. Don’t miss out on the online digital marketing event of the year. Register today!